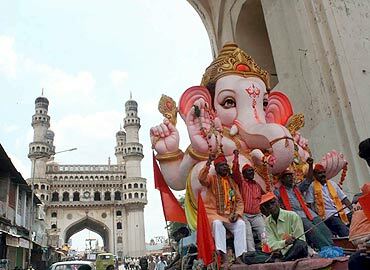 Negating all the apprehensions of trouble and tension, the centralised Ganesh immersion procession in Hyderabad, one of the biggest in India, was on Wednesday held in a relaxed atmosphere with lakhs of people converging on the route as well at the Hussain Sagar lake in the heart of the city. People of all ages turned out in their best to enjoy the festivities and fervour, as the lorries, trucks and trawlers with Ganesh in various forms and sizes slowly moved through the crowds to reach the lake where nearly 80 cranes were deployed to immerse the idols. The Hyderabad city police commissioner A K Khan, who kept moving along the 15 km long route from Balapur in the old city to the Hussain Sagar lake, said that there was no untoward incident and there was total peace and atmosphere was relaxed. "People were extending full cooperation and the procession was moving smoothly," he said. 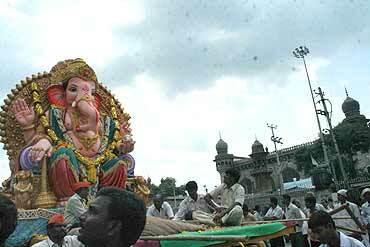 While about 14000 idols were expected to be immersed in Hussain Sagar lake, 700 of them were to come out of the old city. Police commissioner said that the procession will be out of the old city by the evening and attention will be then focussed on the parts of new city. Police had identified 600 problem areas and 300 hyper sensitive areas in the old city and strict security arrangements were made. In all massive security arrangements were in place in the entire city involving 36,000 policemen led by 50 IPS officers. Entire procession route was barricaded and the normal traffic was suspended and diverted on other routes to ensure smooth flow of the vehicles carrying Ganesh idols. Police control rooms closely monitored the situation at all the important points through a network of CCTV cameras as well as 600 video cameras. Leaders of the Bharatiya Janata Party and Rashtriya Swayamsevak Sangha and some state ministers extended formal welcome to the procession from exclusively erected stages at the historic Charminar and Moazzam Jahi market. Those who welcomed the procession include the state home minister P Sabita Indra Reddy and the state BJP president G Kishan Reddy. Majlis-e-Ittehadul Muslimeen had also put up its dais near Mecca masjid to welcome the processionists and its leaders distributed food packets and drinking water sachets. Giving touches of communal harmony to the occasion, several Muslims joined others in welcoming the procession at different places. The afternoon prayers in Mecca Masjid and other mosques on the route passed off peacefully. As per the tradition, the police had stopped the main procession of the old city at Shah Ali Bandar, away from Mecca Masjid for Zohar prayers and the occasion passed off with out any untoward incident. While there were several big idols of sizes ranging from 50 feet to 20 feet in the procession, biggest of them, 72 feet high idol from Khairatabad will be taken out only late in the night and immersed in wee hours of Thursday as it needs special arrangements. The standing idol will be taken out on three trawlers and a special hydraulic crane will be used to immerse it in the lake. 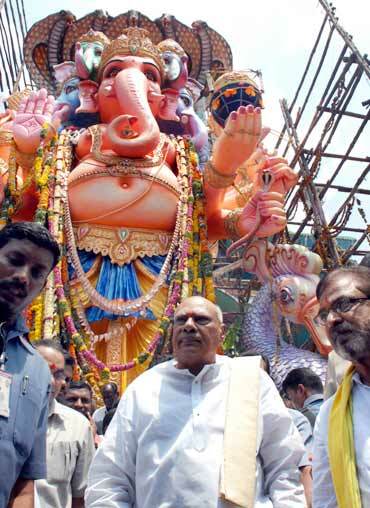 Chief Minister K Rosaiah and several other ministers offered prayers at Khairataba mandap. Speaking on the occasion, he hoped that Ganesh festival celebrated with communal harmony will inspire the people to strengthen communal peace and brotherhood in the state. Replying to a question about the Allahbad high court's imminent judgment in Babri Masjid case, the CM urged the people of all the communities to respect the verdict and exercise restraint. "Those not satisfied with it can always go to Supreme Court in appeal," he said adding that it would not be final verdict. However, heavy rains lashed the city on Wednesday evening, leaving several low lying areas undated. 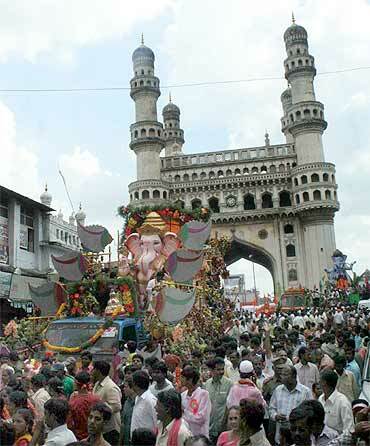 The rains which started at around 5:30 pm, have disrupted the centralised Ganesh procession in old city, Charminar, MJ Market and Tank Bund area. Heavy rains on the route of the Ganesh procession forced the people to take shelter wherever they could, specially the women and children were put to lot of hardship. However the young brigades in the procession enjoyed the rains and continued the procession in drenched clothes. The area around Hussain Sagar was turned in to a sea of humanity with people gathered around the lake to watch the immersion. 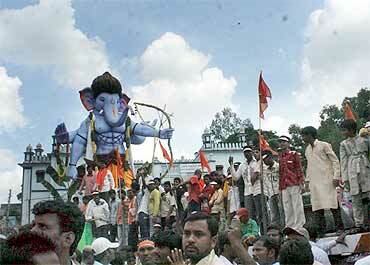 A massive Ganesh in the shape of a balloon hovering over the lake, attracted every body's attention.